"The delicious flavor of freshly cooked bison steaks pairs beautifully with traditional Italian caprese ingredients like basil, fresh mozzarella cheese, and sweet grape tomatoes." Season bison sirloin steaks with salt and pepper. Heat the 1 tablespoon oil over medium heat in a large heavy skillet. Cook bison sirloin steaks in hot oil for 16 to 18 minutes or until an instant-read thermometer registers 145 degrees F, turning once. Top each bison steak with 1 tablespoon of the pesto. Cover skillet and let stand for 3 minutes. Remove bison sirloin steaks from skillet and thinly slice. Meanwhile, cook pasta according to package directions; drain. Toss the cooked pasta, the remaining pesto, the tomatoes, and mozzarella in a large bowl. 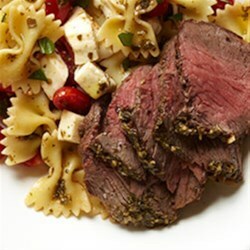 Serve with the sliced bison sirloin steaks. Drizzle with olive oil and sprinkle with basil.